As a Digital Marketing Partner, we want to help our clients make data driven decisions to help them outperform their competitors’ websites on search engine result pages (SERPs). In order to do this, we are strategic about identifying the best keywords for their website. Below you will find a proven strategy to help you identify a keywords and what order they should be in. The number represents what organic rank (Non paid for listing) we are on the SERP, so for “denver web development” we are the 4th result, and for “web development denver” we are 16th, meaning we do not appear until the second page for that specific query. This led us to wonder which query is more important to rank for, “denver web development” or “web development denver”? Which one do potential clients query more often? Google trends (https://trends.google.com/) is a great tool to get a sense of what search queries are trending across a given location and time period. The data is relative on a scale from 0-100 to give you an idea of the popularity of kewords over time. That information is awesome right? But there are limited insights you can gain from that information. The really valuable information comes from comparing multiple keyword queries. In the image above, you can see that people in the United States have searched “web development denver” slightly more often than “denver web development” over the past 12 months. This lets us know that we would appear in front of more potential partners if we appeared on the first page for “web development denver” rather than “denver web development”. PRO TIP: Have you run a similar report and found the results are exactly the same despite ordering the words differently? You can use quotation marks to get the exact word order and even capitalization results. As you can see in the image above, you can generate a report containing multiple sets of keywords, allowing you to more thoroughly understand which of your services are queried more often than the others, and really look through the eyes of the “averaged out” consumer. Looking at this data, it suggests that we should be focusing on marketing towards design rather than development because it is queried more often, right? Wrong. Appearing in more searches does not always correlate to more qualified customers. You have to know who your target customer is in order to avoid filtering through bunch of bad leads which wastes yours and these web users time. For example, because “web design” is very broad, many of these people searching it are likely looking for quick and cheap graphic design jobs where as we focus more on web platform development with the added service of design for these projects. How do I make sense of this data? It is all relative! You may consider the biggest drawback of google trends is that all the data is relative. Going through this article you realize that “web development denver” is searched more often than “denver web development”, but it isn’t until the second image that you discover "web design" queries are searched much more often than "web development" queries. At this point you must be wondering what is the exact number for each? How do I understand the market share to know if it is worth spending a lot of resources on a particular wording order? You can use Google Keywords finder to get this information, but I prefer a Google Chrome/ Firefox extension called KeyWords EveryWhere. Please see the two images below; the volume of searches data is available right under the search bar. You can then use this data combined with your current organic ranking to determine if the searches per month is worth prioritizing certain keyword ordering! 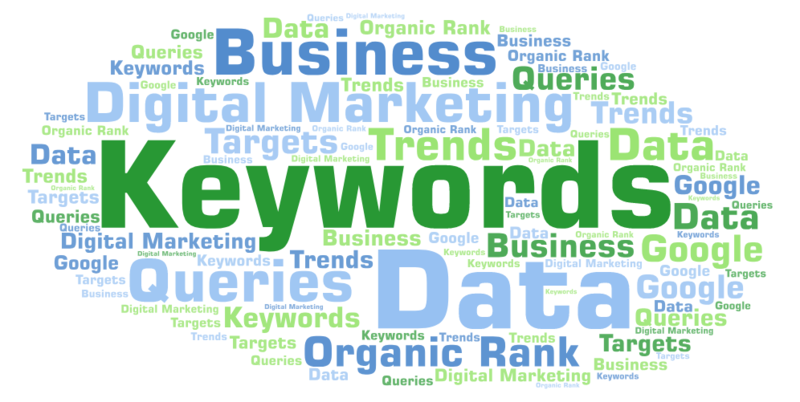 What do Search Volume, CPC and Competition mean on Keywords Everywhere? Search Volume: This is an average of the total searches that people have performed for this keyword per month over the last 12 months. For example, a search volume of 1000 means that people have searched for this keyword an average of 1000 times every month for the last 12 months. CPC: The cost per click (CPC) is the amount that advertisers are paying to Google AdWords for a single click for this keyword. Competition: The competition is a gauge of the number of advertisers that are running ads on Google AdWords for this specific keyword. The number goes from 0 to 1, with lower values signifying fewer advertisers and higher values signifying more advertisers. I hope this light overview of Google trends and Keywords Everywhere provides a good starting point for you to start making data driven decisions about your site!